The aim of my thesis project is to provide a narrated interactive experience that reveals the philosophical, phenomenological and existential implications behind the human reliance on technology usage. The intention of my project is to create an experience that can contribute to the examination of human state of commodification, digitization, monetization, and economization. This interaction attempts to put these processes in a historical context and weave them into a narrative that attempts to tie human usage of tools and technology to its historical precedents–going back to the first tools that were used by agrarian societies. The assessment of this technologic condition provides the dialog necessary to examine, acknowledge and challenge these modes of appropriation, and most importantly, pose a question: ‘how does this technology alter the way I look at myself and the world around me’? The intent behind my thesis is to provide a narrated 3D exposes the historical development of human relationships with technology, and the way it mediates human experience with the world, others, and their own subjectivity. By summarizing the abstract of my project into a sentence, I gained a better grasp of my intents, and the way I ought to pursue and actualize them. However, another problem that had arisen during my critique, was that the intents of my project might be too broad and I should consider narrowing it down to something specific—whether it is a tool, time period, or a technology. Since the history of human relationships with technology is vast and complicated, the exposition that I am attempting to make in my project, might be too broad to serve the purposes of demonstrating how we relate to our technologies today. This had been a big tension throughout the span of my project’s development; while I found some ways of resolving this difficulty, other difficulties would always arise or become highlighted. Particularly in the beginning, when I started out with the present dilemma of human relationships with current digital technologies, I had many ideas that I wanted to develop relating to these technologies. But then I decided to tie these contemporary human relationships with its historic precedents, such as agriculture and machine tools. Although this move clarified the idea that I want to investigate while also providing a bridge that relates every scene to one another; it opened up another wave of problems. I ended up with 4 scenes that were hard to relate to ties coherently into one idea. 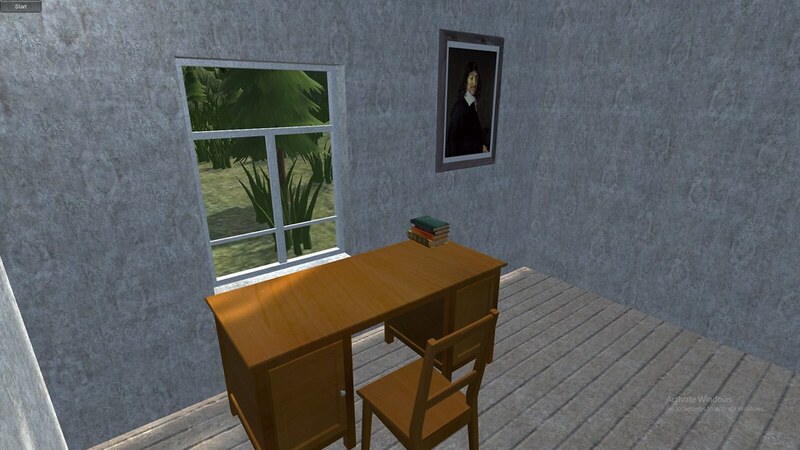 A screenshot of the first scene where which is the first interior environment that the user encounters. For the solution of this problem, I decided to create an introductory scene where people are introduced to an environment where they get to chose what scene to transition towards. I decided to test out is a scene which serves as an introduction and a bridge to all of the other scenes. I found this to be one of the most successful incorporations that I have done in my project so far. Based on some of the feedback, I realized that this introductory scene grounded well the idea that I want to communicate to the user. By having an introductory scene that includes objects that one interacts with and teleports into the historical period that the tools represent—allowed the user to better understand what they are a traveling and investigating something. The positive aspects of this experience was that the users better understood their relation to the interaction, which helped them orient them to the historical context in which I want to ground the narrative/experience in. As of now, the user interaction commences in a house that resembles an interior belonging to a hermit who lives in the woods. Inside the house, there is a desk and a couple drawers filled with books, a portrait of Descartes, and a picture of Albrecht Dürer‘s Melencolia I (1514). Eventually, I would like to tie the significance of these small details to the user interaction, so that the user can find out the relation that these secondary objects have to the general experience. Perhaps an addition of these small artifacts can contribute to the wholeness of this experience without necessarily causing a distraction. 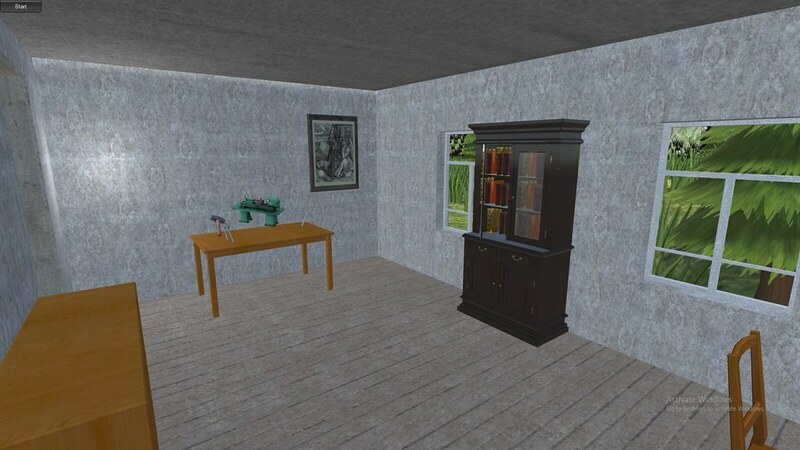 A screenshot showing the interior of the room with a table containing floating objects. And an image of Albrecht Dürer‘s Melencolia I on the right side of it. Although this addition was successful, my midterm critique exposed another problem which I mentioned above; namely, that by covering such a broad historic time scale, I might run into a problem of not being able to ground all these scenes into a coherent exposition of my general concept. Perhaps, focusing on one tool and looking at it historic relations might serve the purposes better to what I’m doing. Or focusing on more than one tool, but limiting their broad historic span and focusing one concrete time period. These thoughts are in the background of my mind as I think of ways of bridging the gap between the user experience and my concept; while I develop the interactions and the user experience. Another aspect of my project that I’m working on for the final show, is the VR experience. While I finally managed to create a preliminary integration of VR aspect into my project, there is still work to be done in this regard, which will be the task that will be worked out in weeks 10 and 11 of my production calendar. When that gets done, the user interactions will become the main priority before they will finally be polished for week 11 and be ready for the final installation.